Most startups don't fail because they can't build a product. Most startups fail because they can't get traction. 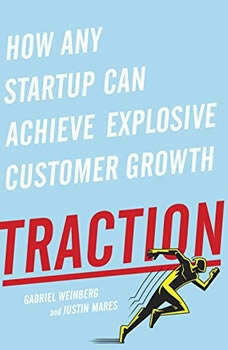 Startup advice tends to be a lot of platitudes repackaged with new buzzwords, but Traction is something else entirely. As Gabriel Weinberg and Justin Mares learned from their own experiences, building a successful company is hard. For every startup that grows to the point where it can go public or be profitably acquired, hundreds of others sputter and die. Smart entrepreneurs know that the key to success isn't the originality of your offering, the brilliance of your team, or how much money you raise. It's how consistently you can grow and acquire new customers (or, for a free service, users). That's called traction, and it makes everything else easier-fund-raising, hiring, press, partnerships, acquisitions. Talk is cheap, but traction is hard evidence that you're on the right path. Traction will teach you the nineteen channels you can use to build a customer base, and how to pick the right ones for your business. It draws on inter-views with more than forty successful founders, including Jimmy Wales (Wikipedia), Alexis Ohanian (reddit), Paul English (Kayak), and Dharmesh Shah (HubSpot). You'll learn, for example, how to: ·Find and use offline ads and other channels your competitors probably aren't using ·Get targeted media coverage that will help you reach more customers ·Boost the effectiveness of your email marketing campaigns by automating staggered sets of prompts and updates ·Improve your search engine rankings and advertising through online tools and research Weinberg and Mares know that there's no one-size-fits-all solution; every startup faces unique challenges and will benefit from a blend of these nineteen traction channels. They offer a three-step framework (called Bullseye) to figure out which ones will work best for your business. But no matter how you apply them, the lessons and examples in Traction will help you create and sustain the growth your business desperately needs.